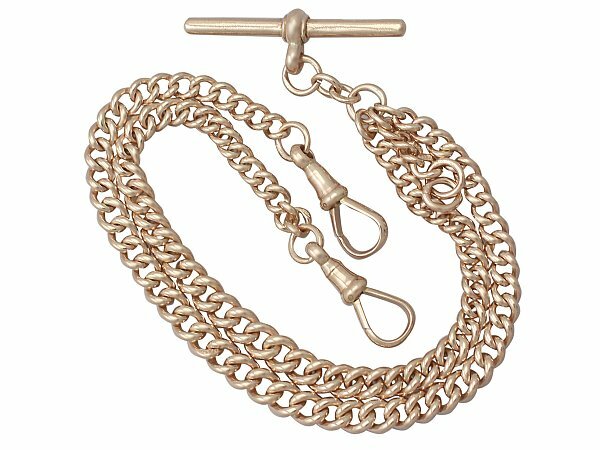 This impressive antique watch chain has been crafted in 9 ct rose gold. Each rounded curb link is individually hallmarked with a 9 ct hallmark '375' and '9'. The watch chain is fitted at either end with the original swivel link clasps. The hallmarks include the 9 ct gold standard mark, the Birmingham Assay Office hallmark (anchor), date letter for 1922 (x) and makers mark F F & Co (Fetter, Forbes & Co). This impressive antique double Albert watch chain is fine quality and is a very good gauge of gold. The antique watch chain is in excellent condition with a full set of hallmarks to the T-bar, and part hallmarks to individual links, the hallmarks show some signs of wear in keeping with the age of the piece but are predominately clear.